Editor's note: Deconstructing Stigma: A Change in Thought Can Change a Life is a public awareness campaign developed by McLean Hospital to spark conversation not only about behavioral and mental health but also about the stigma that surrounds it. The campaign features compelling stories from people across the United States who have been affected by mental illness, including Dimple's story below. Many individuals within the South Asian culture do not share their personal stressors with anyone and prefer to keep these suppressed. The more they keep these negative experiences hidden, the more harm they cause to themselves. I was one of these individuals for several years until I decided to change this and speak out against the stigma. On March 10, 2011, I lost my mother to suicide. I never thought something like this would happen to my family, but it did. My mom was gone. My life changed overnight, and I was forced to become this person I was not ready to be. It was not until my mother's unexpected death that I realized the power of these cultural differences and how they impacted our lives. I struggled to process what happened. When someone asked me how my mother died, I could not say what happened and would avoid answering how she passed away. I felt so lost and confused without her. I felt sad and angry at the same time. I avoided going to temple due to the fears of my family being judged or talked about. The darkness that followed after my mother's suicide was difficult to handle. The reality of what happened set in once the funeral was over and extended family members returned home. It was then that I felt the most vulnerable and lonely. All I could think of was the "what if" and "could have" scenarios and replayed it in my head. I just missed my mother immensely, and the only way I felt connected to her was by dreaming about her. Various ethnic cultures, including the South Asian culture, often label these individuals who experience psychological disorders and underestimate the serious symptoms the individuals endure. I did not share my story with anyone because I was afraid of how others in my culture would perceive this situation. My mother and I were born in the same country, but raised on two different continents. Growing up in America, I found it easier to walk into DePaul University's counseling center and ask for help. On the contrary, this is not the case for individuals, such as my mother, who were impacted by the stigma and shame related to discussing mental health issues. These individuals may not be as inclined to seek professional services due to the cultural pressures and barriers against treatment. Additionally, there is a lack of knowledge of the resources and treatments that are available within the community. I had multiple things happening in my life that were making me realize how much I wanted to speak up about suicide prevention and depression as well as raise awareness. I decided to be proactive in researching what local organizations are out there for me so I can be more involved. During my research, I came across the American Foundation for Suicide Prevention in Chicago. I was supported by creating my own team (Team Patel) for the Out of the Darkness Chicagoland Walk in 2014. Yet, I still was not ready to share why I started Team Patel. It was not until Team Patel's second walk that I finally developed the guts to share why I was walking in the Out of the Darkness Chicagoland Walk. I decided to share my mother's story and what my family went through after her suicide with others because it occurs far too often within the South Asian culture. After she died, I noticed how everyone was quick to place blame on others and analyze the situation. I wanted to give my mother a voice, People judged her suicide, her actions, but dismissed the biggest issue of all, her mental health. I am taking an active role in educating and raising awareness around mental health issues within the South Asian community. Not many people speak up about mental health and suicide prevention-related issues within this population, and I wanted to take that step towards reducing the stigma. I was terrified to share my mother's story online, but I had to think about all the positives that could come from it. I wanted to share my mother's suicide with others because issues like this are often hidden, especially in my culture. Since I have shared my mother's story, I have gotten support from various individuals. We live in a culture now where social media plays an important role in much of what we do. I use my social media accounts to actively spread awareness about mental health issues as well as advocating for the American Foundation for Suicide Prevention: Out of the Darkness Chicagoland Walks. I share this next point, since it exemplifies why I decided to reach out. I got a message on Facebook a year ago from a young woman in her late twenties that had gone through the same thing as me. For the past ten years she has been dealing her mother's suicide privately as she said, "I haven't had the courage to openly talk about it and I admire your courage and powerful post. I have always felt like there couldn't be anyone in the world that understands what we are going through, especially in the Indian community." 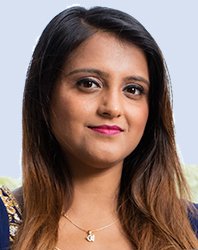 As a result, she joined Team Patel and used her social media account as a platform to spread further awareness. Team Patel has become the largest South Asian team participating in the Out of the Darkness Walks in Illinois. The walk is just the first step in my journey to connect with other individuals who have experienced similar life events. This story does not start and end with me; however, it is a concern that is applicable to many South Asian individuals and minority cultures. By speaking up publicly and processing my own pain, I have gotten more comfortable addressing suicidal issues with my family, friends, and others with whom I interact. Furthermore, as a current doctoral student in clinical psychology, I use my education and training to aid in my prevention efforts. I work to utilize the resources that are available to me to help spread the awareness about mental health issues to those that do not have access to it. Being involved with the American Foundation for Suicide Prevention - Illinois Chapter and PROJECT 375 has been a tremendous part of my growth as I continue to develop my skills and bring a different perspective to the table. I want others to join me and speak up about mental health issues, not only within the South Asian culture, but other cultures as well. This issue is too important to keep quiet. Dimple Patel is a 29-year-old doctoral student in clinical psychology from Illinois. To read more about Deconstructing Stigma and to meet more people like her, visit DeconstructingStigma.org.